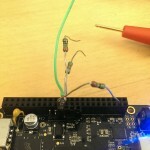 Patch for u-boot mainline master (http://git.denx.de/u-boot.git) to prevent BBB’s to get stuck in a u-boot prompt because of spurious characters being received on the serial console (see http://www.mikini.dk/index.php/category/beaglebone-black/boot-issue). Patch and compiled binaries at http://www.mikini.dk/wp-content/uploads/2015/01/u-boot_mainline_BBB-autoboot-patch_201501151.zip. Install the new u-boot by copying the files “MLO” and “u-boot.img” to the root directory of your boot device (first FAT-partition on your SD-card or onboard MMC). Using the stock Debian image (http://beagleboard.org/latest-images) this can be done via USB by powering the board from your computers USB-interface, waiting for the BBB to boot and register its drive as an usb mass-storage in your OS. Now use your favorite file management application to copy the files from the above zip-file replacing the existing files. Disclaimer: this is mostly an experiment, there is a lot of u-boot trees and patches floating around for the BBB (like https://github.com/beagleboard/u-boot), so probably mainline hasn’t got the most recent stuff for AM335x/BBB yet. This is test report 3 in the series of tests on the “BBB doesn’t boot” issue, discussed here on the BBB mailing list. The present test is accompanying this specific post in the discussion thread. 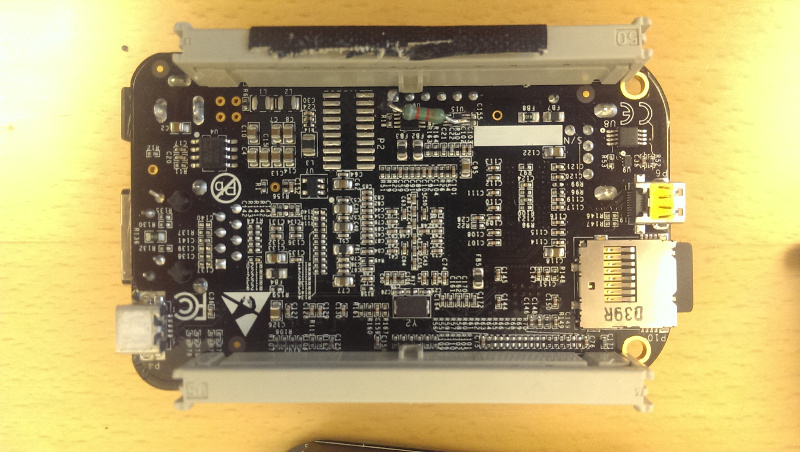 The goal of the test is to establish under which conditions the U15.2 (1A) input provides a stable boot experience. The four test subjects are a strong pull down of 990 ohm and 0 ohm, and voltage divider circuits using 0 ohm and 1k ohm fixing the voltage at respectively 3.3V and 0.58V. The strong pull down of 990 ohm and 0 ohm on B_UART0_RX doesn’t prove successful, as was also the case with the weaker pull down of 45k2 ohm in test report 2, and the factory mounted pull down of 100k ohm. But providing a stable 3.3V or 0.58V using a voltage divider with resistor values 0 ohm and 1k ohm results in a booting BBB in every test case! This is analogous with the result of test 2 in test report 2, which established the same fact, but for B_UART0_RX = 1.81V using a 82k5 ohm resistor. The second picture below shows an easy and safe way to establish the condition of test 3 as a permanent fix on the backside of the BBB pcb. It places an insulated wire between VDD_3V3B from terminal 5 on the non-populated P2″CTI JTAG, DNI” header and the B_UART0_RX signal on J1 (UART0 Serial Port) pin 4. 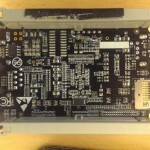 B_UART0_RX pull up/down test mockup. 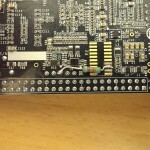 Permanently fixing B_UART0_RX (J1.4) to VDD_3V3B (P2.5). down on B_UART0_RX with resistive value of 1/(1/1k+1/82k5)= 990.1 ohm. P8.1 (DGND), thus forcing 0V on B_UART0_RX. P8.4 (VDD_3V3B), thus forcing 3.3V on B_UART0_RX. Connect cable Mini-B male to DUT USB Mini-B female. Insert PSU into mains socket. A connector from the mains adaptor inserting it immediately repeating the test. Results can be seen in section Test Results. instead of just pulling up/down indeed makes the system boot at every power up. whether this voltage is low (0.58V) or high (3.3V). 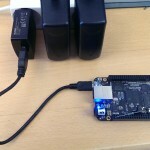 I’ve been hit by the “periodic boot failure” issue of the Beaglebone Black (aka BBB) reported by quite a few on the net. For most users this is an inconvenient annoyance, but for people, like me, using the platform in embedded applications, this issue causes a serious stability issue of the whole system, when 100% reliable boot is not achievable. After having hunches about instability caused by the intermittent experiences during development, where the board was seen failing boot on power on, and not getting much more help from the net than “try the recommended power supply” (which btw. I can’t use because I live in a country where main sockets are non-US, even a bit non-European standard) I decided to make a systematic test to get the basic facts straight. 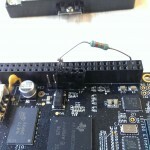 I settled on trying to establish some reasonable statistics about the error’s frequency on plain BBBs to have a reference against testing whether a theory put forward on the mailinglist (here and here) about the uboot bootloader being confused by noise being interpreted as valid data on UART0_RXD (pin E15) of the AM3358x (see near U15 page 4, of the BBB REV B schematics) as the cause of the failure. This is the results (test report detailed below), I’m posting a writeup in the Beagleboard mailinglist (Edit: my post here), so hopefully you’ll find further discussion about this issue there soon. The two differing Element14 branded BBB products I have access to, but both PCB REV B6, exhibits a somewhat varying boot failure rate. But overall the boards fail to boot in almost 4 of 100 boots. 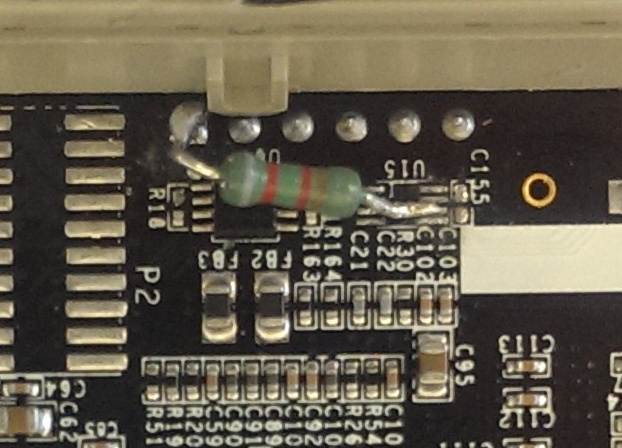 Investigating the theory relating to noise on UART0_RXD seems to have paid off, as first removing U15 (SN74LVC2G241: Dual Buffer/Driver With 3-State Outputs) for the purpose of adding a pull down on its pad 6 (which is connected to UART0_RXD) alleviated the problem altogether. But also the experiment of removing the pull down and redo the test, showed that the act of removing U15 itself caused the boot to always succeed. Unfortunately, in hindsight, I was too quick to grab the soldering iron, because I should have verified and quantized the occurrence of the failure on the actual board being modified. A shame It didn’t occur to me before modification, but I’ll be more than willing to try to remove U15 on DUT#2, which has had the highest failure rate, if discussions prove that it is a reasonable theory of the root cause of the failure. That is why I continued testing it through to 120 boots, to get more samples for improving statistics in the event that I pull U15 from it later. The activity when U15 is in place is somehow exhibited on output 1Y (pin 6) , probably because it is not stable, and thus has an erratic state, during the first moments of the chips power up sequence. 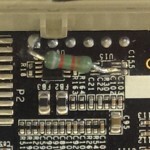 This erratic behaviour can in fortunate/unfortunate circumstances be interpreted as valid bits and resulting bytes by the uart rxd cirtcuitry, which also can happen to be latched into the uart fifo rx buffer, waiting for uboot to read them when its code is executed looking for a user interrupt. I’ll put in the disclaimer on this thesis, that I haven’t yet studied U15 in detail, but it is advertised as both a level converter, ESD protection and power live-insertion/partial-power-down suggesting it does something in reaction to it’s power condition. Also the recommendation on page 1 of its datasheet; “To ensure the high-impedance state during power up or power down, OE (active low) should be tied to VCC through a pullup resistor, and OE (active high) should be tied to GND through a pulldown resistor”, seems not to be followed in the BBB circutry, as the OEs are hardwired in to be always active (opposite of the recommendation in the power up/down condition). If this is actually a problem, I need to do further analysis to establish. Jentec PSU used (from D-Link USB hub). U15 removed, pull down added. Closeup of U15 removed, pull down added. 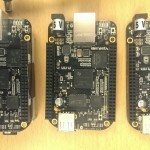 "beaglebone"+ beagle logo and "beagleboard.org"). 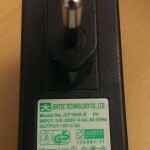 Jentec Technologies CF1805-E, output 5V 3A. Danish plug. Sourced from a D-Link DUB-H7 USB 2.0 HUB. The power supply and SD-card used was the same for all three DUTs. Results can be seen in section Test 1 results. to see if the behavious was restored. Otherwise test procedure was identical to test 1. Results can be seen in section Test 2 results. Working on a Beaglebone Black based product, running the latest Debian GNU/Linux system image (bone-debian-7.5-2014-05-14-2gb.img) from the BB HQ at beagleboard.org I just had the following strange experience. 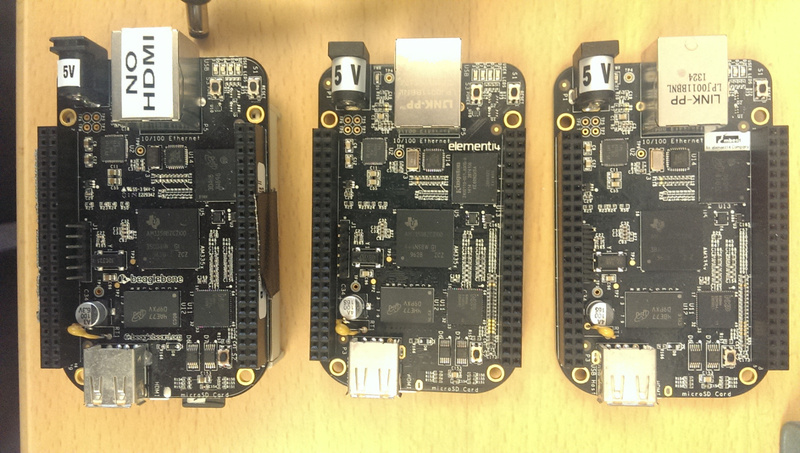 debian@beaglebone:~/VCAS_FR$ svn ci rc.local -m"Append to vncserver.log." This failed repeatedly, and checking out a fresh new working copy exhibited the same result. For the fun of it, because file name issues are long gone in my everyday computing life, I tried to remove the space from the directory path. And voila, unexpectedly it succeeded! Without spaces, things actually did work. Apparently there’s an issue with ARM built subversion and repositories containing spaces. Probaly, this has been fixed since, a quick investigation in svn issue tracker revealed no open issues regarding this. I’ll look further into this later, and of course report it appropriately if this is an unknown issue. But as you see, you can still experience basic issues on the latest and greatest stuff out there. Be wary! 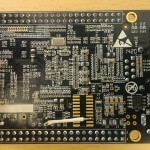 A very annoying feature of the Ångström image that is shipped with the BeagleBone Black, is that a display connected to the HDMI output of the board will by default be blanked when powering up, and is first woken when any pointer activity occur (touch/mouse). This seems to originate from the fbdev that is used for displaying graphics, and it took me some time to figure out how to cirumvent it. The normal X commands for controlling blanking of “xset -dpms” or “xset s off” did nothing, and neither did the terminal options of “setterm powersave off” or “setterm powerdown 0”. I went all the way back to old ANSI escape sequences trying “echo -e ‘\033[9;X]'” without success. disables blanking and wakes up the BBB HDMI output. To do this at every boot (really login) you can use the Gnome Startup Applications Preferences (gnome-session-properties) to execute this at Gnome autologin, or add it to whatever startup script you see fit. Beware that you might need to delay the execution when using the gnome-session-properties, I had to put in a sleep, but that probably depends on what other stuff is starting up from it.